“I am really enjoying the online training, and it is such a great tool. The following presentations are available to purchase on a pay to view basis, also in bundles. In order to assist you in selecting the right presentation a short extract is available to pre-view by selecting the appropriate link. Once you have decided to purchase, select the relevant presentation link and add it to your account. You will then be able to view purchased presentations up to 6 times for the next 3 months (“Full access” available for 6 months). Downloadable valuable training resources for offline usage. All of the presentations are delivered by OCTC specialist staff, considered to be amongst the country’s leading experts in the field of Cognitive Behavioural Therapy (CBT). The training covers a wide range of CBT topics from introductory through to advanced. The combination of lecture and role play significantly develops your skills and knowledge of CBT techniques and provides an effective and cost efficient investment in your professional development. Our online presentations, using leading edge online training technology, combine lectures and role-plays with synchronised power point sessions. They are the easiest and affordable way of receiving CBT training from the best specialists. All videos shorter than 10 minutes are free). Certificates of viewing online modules are available and are based on your viewing history. For technical issues please check our Online Training FAQ. Facilitated by David Westbrook – a founder member and a former director of OCTC. David was a BABCP accredited therapist, trainer & supervisor. He was one of the editors of the Oxford Guide to Behavioural Experiments in Cognitive Therapy, and together with Helen Kennerley and Joan Kirk he wrote a new book for beginners, An introduction to CBT: skills & applications. In this presentation David explains the basic theoretical model of CBT, as well as some of its characteristic ways of looking at psychological problems. This presentation is an excellent source of knowledge for all people wishing to familiarise themselves with CBT or those who know the concept, but want to consolidate their knowdledge. It is suitable for both low and high intensity IAPT trainees and workers wishing to refresh their knowledge and skills or practioners with basic CBT training. Please click the link to purchase the presentation. In this presentation David outlines the nature and role of CBT ‘formulation’, a powerful tool for making sense of psychological problems so as to help both client and therapist to think clearly about them and come up with a therapeutic plan. Later chapters show you how to carry out an assessment using a CBT model, and how to use the information from that assessment to develop a CBT formulation in collaboration with your client. These strategies are illustrated by a role-play of an initial assessment session & a subsequent session on developing the formulation. 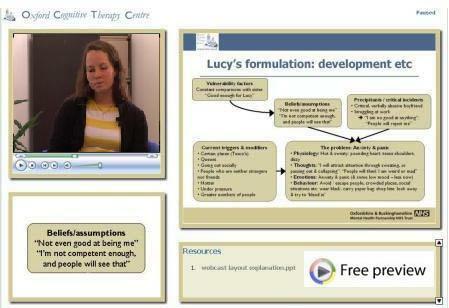 Suitable for IAPT high and low-intensity trainees or workers who understand the basic CBT concepts, but wish to improve their understanding of this particular tool – the role play will help you turn theory into practice. Please click the links below to purchase the individual presentations or click here to purchase the whole module. Facilitated by Gillian Butler – In 2002, BABCP members voted Gillian one of the most influential female cognitive therapists in Britain. Start as you mean to go on. This module shows you how to use the collaborative style of CBT to maximise the effectiveness of treatment. The role-play will demonstrate using the technique in practice, even when working with a talkative patient, or when there is a problem in the therapeutic relationship. This module also demonstrates the value of keeping the cognitive formulation, including ideas about underlying beliefs, in mind at all times. Suitable for high and low-intensity trainees or workers within the IAPT programme or CBT therapists with basic knowledge. Not only the sessions familiarise you with the collaborative method, bu they will also demonstrate how to use the technique in practice. Faciliated by James Bennett-Levy – recognised as one of the leading writers/researchers on CBT training and therapist skills development. James has developed an innovative self-experiential approach to CBT training known as self-practice/self-reflection. The purpose of this module is to highlight the importance of goal setting in CBT, and to introduce some of the key principles and practices of goal setting. In particular, the focus is on: the value of goal setting; setting goals which will be useful; key questions in goal setting; other key techniques (e.g. imagery) which facilitate goal setting. The presentation features a role-play with a depressed client where some of the key questions and techniques are utilised. Suitable for high & low-intensity trainees and workers withing the IAPT programme. It is one thing to set goals. It is another to achieve them. This presentation focuses on two techniques to enhance goal attainment: identifying strategies to achieve goals (outcomes), as well as the outcomes themselves; and using a dimensional, or continuum, approach to goal-setting as an aid to measuring and re-measuring for certain types of goals. A role-play demonstrates the use of these techniques with the same depressed client as in the introduction to goal setting presentation. Suitable for high & low-intensity trainees and workers withing the IAPT programme or practioners with basic CBT training. Facilitated by James Bennett-Levy – recognised as one of the leading writers/researchers on CBT training and therapist skills development. James has developed an innovative self-experiential approach to CBT training known as self-practice/self-reflection. • Providing a framework and typology for behavioural experiments to enable clinicians to consider different types of behavioural experiment, and devise an experiment appropriate to the particular circumstance. In Part 1, we address a typical problem in depression – withdrawal from friends – and set up a behavioural experiment to test the clients ideas that her friends won’t want to see her, and they’ll think of her as ‘pathetic’. In Part 2, we take another typical problem in depression – being disorganised – and use the Weekly Activity Schedule as a behavioural experiment, to help test out a new idea, ‘I’m an organised person’. These modules are suitable for high-intensity trainees and workers on the IAPT programme and practicioners with the basic CBT training. Facilitated by Helen Kennerley – She is an experienced clinician now specialising in childhood trauma, dissociative disorders, and self-injurious behaviours and a BABCP accredited therapist, supervisor and trainer. Socratic questioning has been called “the cornerstone of cognitive therapy”. This workshop tells you what it is and shows you how it’s done. It describes in detail a key technique – downward arrowing – and examines the use of Socratic method across the breadth of therapy: in assessment, in challenging unhelpful cognitions and in problem solving and testing predictions. The dos and don’ts of Socratic method are also addressed. This presentation will be relevant to all cognitive therapists who want to develop or refresh their basic skills, and ensure that they get the most from Socratic work. Suitable for high-intensity trainees and workers involved in the IAPT programme. It will suit other qualified CBT therapists too. Facilitated by Ann Hackman particularly known for her pioneering research, writing and teaching on the role of imagery and memory in the anxiety disorders and Freda McManus – currently the Director of the University of Oxford’s Postgraduate (Masters level) Diploma in Cognitive Therapy, and a Clinical Research Fellow in the University of Oxford’s Department of Psychiatry. These presentations guide the therapist through the stages of CBT for panic and agoraphobia. Role plays and lecture are used to show how to draw out a collaborative formulation, socialise the patient to the cognitive model, design effective behavioural experiments, and use imagery techniques to work with upsetting memories and images. The presentations are suitable for high-intensity trainees and workers within the IAPT programme or experienced CBT practicioners. Facilitated by Norma Morrison who was a member of Prof. Paul Salkovskis’ team on the OCD Treatment Trial from 1995-2000, and has co-written chapters on OCD in the Oxford Guide to Behavioural Experiments. Please click the links below to purchase the individual presentation or click here to purchase the whole module. In this video, you will learn how to help the client challenge their appraisals by various methods, including the use of a pie-chart appropriate behavioural experiments will be discussed and ideas for dealing with obsessional thoughts (in the absence of overt rituals). Suitable for the IAPT high-intensity workers and trainees or professionals with advanced skills. Facilitated by Emily Holmes. She is a Senior Research Fellow holding a Royal Society Dorothy Hodgkin Fellowship at the University of Oxford’s Department of Psychiatry. She set up the EPACT (Experimental Psychopathology and Cognitive Therapy) Research Group with the assistance of the ESRC and the John Fell OUP Research Fund. This presentation is suitable for high-qualified CBT practicioners or high-intensity trainees and workers within the IAPT project or practicioners with advanced skills. It has been designed to introduce the Mental imagery and formulation techniques. Sometimes, in CBT, the therapist needs to move beyond automatic cognitions to fundamental beliefs. This workshop gives guidance on when this is appropriate and how to elicit core beliefs in ways that are sensitive to the client’s needs and personal resources. It then describes three key techniques for working with them: continuum work, a powerful strategy for combating the extreme quality of problem core beliefs; positive data logs which are helpful in constructing more adaptive beliefs; and keeping flashcards, an essential technique for consolidating progress. This presentation will be relevant to those seeking a theoretical and practical introduction to working with core beliefs and people who wish to continue their professional development. It is suitable for IAPT high-intensity trainees and workers as well as other qualified CBT staff. Please click the links to below purchase the individual presentations or click here to purchase the whole module. In this chapter Martina will describe when reliving is necessary and how to help your patient get ready for it. In this chapter Martina will demonstrate how to carry out a reliving session, and how to identify unhelpful appraisals. This process is illustrated by a video of role-played reliving session of a Road Traffic Accident. In this chapter you will be shown how to inserting updated information into a traumatic hotspot to help. The process is illustrated with another role-play video. This module is suitable for high-intensity IAPT trainees and workers or professionals who have knowledge about CBT, but would like to improve their skills and broaden the variety of CBT techniques they employ. Facilitated by Melanie Fennell. Melanie was a pioneer of cognitive therapy for depression in the UK, and a founder member of OCTC. In July 2002, at their 30th Anniversary Conference, she was voted “Most Influential Female UK Cognitive Therapist” by the membership of the British Association of Behavioural and Cognitive Psychotherapies. This presentations demonstrate how a cognitive model of low self-esteem, developed by the presenter, can help clinicians understand the development and maintenance of one of the most common transdiagnostic problems encountered in clinical practice. A coherent treatment programme is suggested, based closely on the model. Key points are illustrated with extracts from therapy sessions with a client with low self-esteem, and there are opportunities to apply the ideas to your own clients. Designed by the world renowned expert in CBT this module is structured and very thorough. This module is suitable for high-intensity IAPT trainees and workers or practicioners seeking professional guidance in developing their knowledge about self esteem. Facilitated by Deborah Lee who is a founder member of the first Traumatic Stress Service in the UK. She currently runs the specialist Trauma Service in Reading. This module explores the use of compassion focused approaches to work with shame and self attacking thoughts. First we explore the theoretical background of compassionate mind as developed by Paul Gilbert. Then we move onto to look at how to formulate cases using this approach. Specific ways of working with self-criticism and shame based memories, through the development of compassion, are presented. Finally the use and development of compassionate imagery, the perfect nurturer’ is presented. This module is also suitable for high-intensity workers and trainees involved in the IAPT programme or experienced CBT practicioners. This bundle will give you access to all basic modules from our training library. This bundle will give you access to all advanced modules from our training library. This option will give you instant access to all resources available in our library.